Restoration service for video content recovery from previous generation LTO tapes - Service is available for LTO-1, LTO-2, LTO-3, LTO-4, LTO-5 and LTO-6 tapes. Send in your LTO tape, along with your external hard-drive, and we will restore your archived video content and place it on the provided hard-drive. Pricing is $100.00 per tape. Place your order in our web online store, and receive a link to print off a UPS label for free shipping into Cintrex. 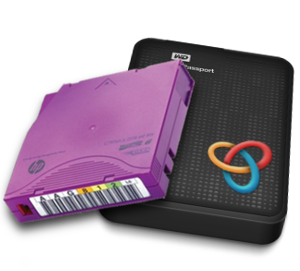 Include in the package your LTO tapes and your hard-drive into which we will place the tape's restored contents. Please provide documentation on job scope - specify your expected outcome, and how you want the restored video files organized on your hard-drive repository. If possible, please include the tape catalog, so we have something to compare restored contents to your database records. Average turnaround within our labs for this service is 1 to 2 days for each 4TB of video being restored. This does not include shipment transit time. Restoration process includes inventory of contents upon receipt into our lab, review of customer provided instructions, testing of LTO tape formatting for compatibility with our systems, restoration of video files, organization of files onto hard-drive repository, matching source and destination files, cataloging contents and capturing screen shots of tape and hard-drive file layouts. You receive back the LTO tape(s) along with the hard-drive repository containing the recovered video files. Benefit of the Service: Restoration of tape contents for re-purposing and backup purposes. For custom quotes fill out our Digital Archival Service Form or please call us at 800-325-9541. From Alex of Bloomington, Indiana on 9/10/2014 . We have just recently started reviewing the tapes to get a sense of the footage that's on them, but so far navigating the hard drives and reviewing the footage has been easy and well-organized.